Brennan’s luminous writings graced the New Yorker’s “Talk of the Town” section for nearly 30 years. Dating mostly from the 1960s, these “moments of recognition,” as she called them, are delicately crafted summonings of a New York City that has mostly disappeared. 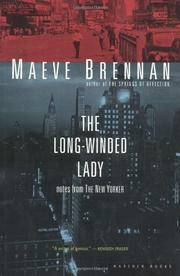 Her sketches of life in Times Square and Greenwich Village ran under Brennan’s “Long-Winded Lady” pseudonym from 1954 to 1981. No other writer has so subtly or effectively captured “the ordinary ways” of the city’s denizens. Eavesdropping in restaurants, in bars, and on street corners, Brennan illuminated the human condition with deceptive simplicity. Observing two “opulently shaped girls” at the Adams Restaurant on West 48th St., she notes, “Their walk was sedate, as it might well be . . . their dresses did all the work.” Watching a bejeweled, overdressed woman breakfasting at the Plaza, Brennan wonders, —Was she splendidly unselfconscious, or was she ridiculous? I didn’t know. I was tired of her.” She mentions, in passing, the apartments she kept, uptown and downtown, over the years, and decries the coming of the 1960s “ogre called office space” that displaced townhouses and brownstones on the avenues she knew so well. Whether relating a clumsy encounter on the subway or etching a street scene, Brennan wrote extraordinary sentences such as this one, describing Washington Square at 6 a.m. following a night of rain: “The air was mild and fresh, and shone with a faint unsteadiness that was exactly like the unsteadiness of color inside a seashell.” Nine previously uncollected pieces are included here, in addition to the 47 that appeared in the book’s 1969 edition. Brennan exemplifies what the old New Yorker was all about.